Choose the Euramax Canada Traditional-Style Gutter System to channel and redirect rainwater runoff to prevent erosion and costly foundation damage. The 2 in. x 3 in. Vinyl A Elbow has crush- and dent-proof vinyl construction for durability. Use it to redirect downspouts that are perpendicular to help prevent garden erosion and foundation damage. This A elbow is designed to withstand extreme temperatures and can be used with metal and vinyl downspouts. Call 1-800-461-5706 for warranty information. Alu-Rex Maximum Sturdiness rain gutter protection for homes offers you a sturdier protection to prevent damage caused by ice and snow. It's made of aluminum and built tough to provide years of dependable service, preventing rain gutter and roof damage caused by freeze/thaw cycles. This rain gutter has just the right array of perforations to let water in and keep debris out. For sturdier rain gutters and maximum protection! It will accommodate many angles and keep erosion from critical areas. Flex-A-Spout adapts to 4" corrugated underground drain pipe. Extend It, Bend It, Connect It, Bury It! Controlled drainage. Diverts water away from foundation and around trees, shrubs and decks. Disperses rainwater at bottom of downspout. Stops lawn and garden erosion and prevents foundation damage. Natural Stone appearance. Durable polypropylene! Engineered to withstand North America's worst conditions (-40? to 150?F or 65?C) including ice and desert heat. Maintenance-free! Never needs paint! Cleans with a hose! Keeps leaves and debris out of gutters. Stops rainwater from running down fascia. Flexible, durable vinyl. Fits Rain Master Traditional Hooks. Slides into top clips of hooks with wide flange to fascia. For quantity required, divide roofline by 6 Ft.
Elbows Traditional A White Vinyl Choose the Euramax Canada Traditional-Style Gutter System to channel and redirect rainwater runoff to prevent erosion and costly foundation damage. The 2 in. x 3 in. Vinyl A Elbow has crush- and dent-proof vinyl construction for durability. 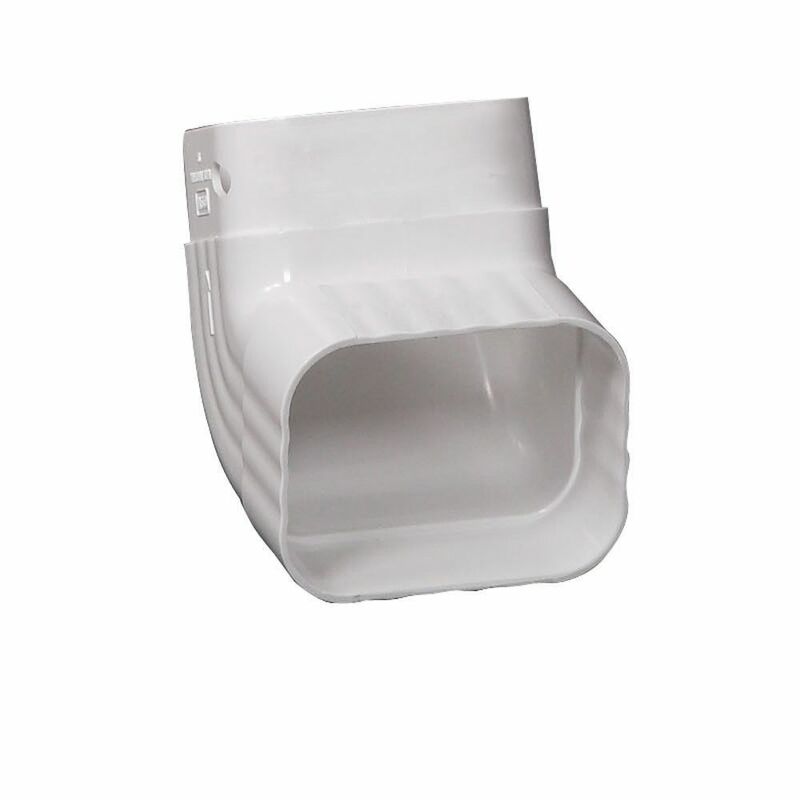 Use it to redirect downspouts that are perpendicular to help prevent garden erosion and foundation damage. This A elbow is designed to withstand extreme temperatures and can be used with metal and vinyl downspouts. Elbows Traditional A White Vinyl is rated 5.0 out of 5 by 7. Rated 5 out of 5 by pnberube from Needed to adjust length to match up to an underground drain pipe. This system allowed me to add ... Needed to adjust length to match up to an underground drain pipe. This system allowed me to add on pieces to get exactly what I needed for length. Just hope it holds up to UV. Rated 5 out of 5 by Hausmeister from Works as advertised Easy to install. I installed a gutter system in front of a preschool classroom because at our school there are no gutters installed. (I'm the custodian) It worked so well that some of the other teachers are asking me to do the same in front of their classroom doors.